Aggregate is one of those words everyone knows – but rarely uses. So, we thought we’d put together this information sheet on aggregates just for you. For our purposes, aggregate is mostly used as either a noun or an adjective. 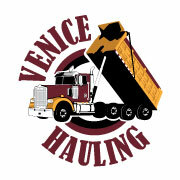 For instance, Venice Hauling sells aggregates; a noun describing rocks, gravels, sands, shells, etc. This means aggregate is a collection of materials forming a whole. Road base is a great aggregate example. It is a whole, road base, that is formed of many different materials; lime stone, sand, calcium, shells, etc. a whole formed by combining several (typically disparate) elements. the total number of points scored by a player or team in a series of sporting contests. a material or structure formed from a loosely compacted mass of fragments or particles. pieces of broken or crushed stone or gravel used to make concrete, or more generally in building and construction work. formed or calculated by the combination of many separate units or items; total. form or group into a class or cluster.